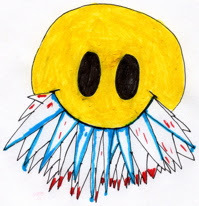 A man I know called Dan is part of a thing called called Project Friendly which involves sending anonymous people envelopes with drawings on them and stuff. 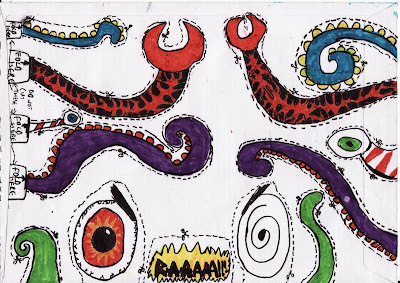 You can put whatever you like inside them, as long as the envelope is decorated in some way. You were holding a folded up monster in your hands and you didn't even know! I DON'T KNOW WHO I AM ANY MORE! I'm not really sure where I was going with the links. I just thought they might be useful. 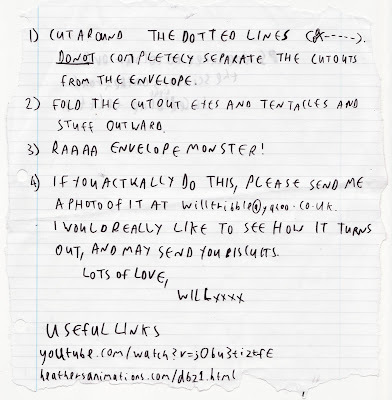 I had a slightly longer list but I kept misspelling the URLs, so I ripped out that bit, and then I was like "sod it, I've written this much and writing is hard, I might as well do little rips everywhere and pretend it is a weird art style thing". I coloured in the front last, after I'd done the little scissors, then felt bad about it. 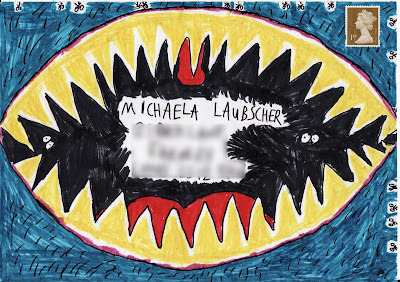 Maybe Michaela might prefer a full colour envelope monster and not really care about the white patches and the scissors round the side. 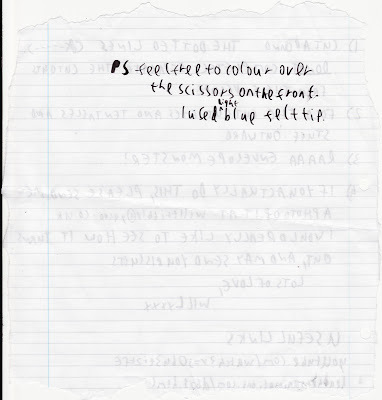 I better leave detailed instructions in case she wants to find the same colour and go over those bits. I hope Michaela actually does it. I hope Michaela actually does it and it actually works. I'd like to see the results. You can see some more Project Friendlies scattered around on http://www.facebook.com/group.php?gid=194802919464 and http://www.facebook.com/album.php?aid=10797&id=100000390223470 . Personally I think there should be a Flickr page so they could get more people involved. Maybe I'll poke Dan with a stick and tell him that. PS oh go on then. Doing a video art installation, come and see it!